he has long wanted to write. From his earliest years, John remembers wanting to be a writer. He describes his series, Tyrants and Kings, as an offspring of his passion for both epic literature and military history. In 1994, while employed as a technical writer for a computer software company, John met friend and fellow aspiring writer Ted Xidas, who convinced him to try and write a novel. Armed with no fiction writing credentials but a lot of support from friends and family, John took his friend's advice, and The Jackal of Nar was the result. After shopping the novel around to several publishers, editor Anne Groell at Bantam Spectra showed interest in the book, then worked with John to polish it up and get it ready for publication. It debuted in March, 1999, both in the U.S. and in several other countries, to rave reviews from Kirkus, Publishers Weekly, Library Journal and many others. The novel has been praised for the fascinating fantasy world in which it is set, its thrilling action scenes and, most of all, its interesting and complex characters. John was born and raised on Long Island, New York, where he still currently lives and works. 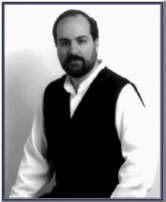 He has attended various classes on writing, and had worked as a technical writer for ten years. His work experience is eclectic, and includes such varied industries as aviation, medical technology, software, and home security. Since the publication of his novel, he has left the corporate world behind to give his full attention to writing fiction. He is currently working on the next book in his series, titled The Grand Design. John spoke with us about his move from being a technical writer to a fantasy novelist, how he created his new epic fantasy series, and gives some tips for aspiring fantasy authors. Honestly, it seems like forever. One of my earliest memories is of borrowing my sister's typewriter and pecking out a dreadful story about a secret agent, or something like that. I couldn't have been more than ten years old at the time, and I probably thought I had written something brilliant. I remember showing it to my mother and her being proud of me. Then, as I got older and went through High School, I started taking some writing classes and discussing it with my teachers. They were all very supportive and encouraging, and I knew it would be something that I would enjoy, if only I could figure out a way to make a living at it. What did you like to read when you were a child? I started off with comic books, and I'm sure I was influenced heavily by them. Even before I could read I was looking at the pictures, pretending that I could tell what was happening. I was really into Spider-Man, I remember, and the other Marvel superheroes. They were just great. Then, as I got a little older I discovered Science Fiction and Fantasy. I remember going to the library with my mother and scanning the shelves for Science Fiction titles; anything with a really cool cover grabbed my interest. That's where I discovered some of the genre's greats, like Edgar Rice Burroughs and Fritz Leiber. There were so many writers to discover, and I was overwhelmed by the numbers. It took time for me to decide what kind of stories I liked the best, and before long I settled on fantasy. How did you get your start as a technical writer? My father was a big influence on that decision. He was a technical writer himself, so he knew what was required to get a job in the field. He also knew that I wanted to be a writer, and I suppose being a technical writer was a good match for me. When I was growing up, I was always tinkering with computers and ham radios and televisions. When you're a technical writer, being able to write is only half the battle. You also need to understand how things work, and be able to explain them. The trouble was that I was always more into the "writing" part, and less interested in technology. As I got older, my interest in computers and things waned considerably, probably because I was constantly surrounded by them in my various jobs. I became something of a luddite, which is really strange for someone who enjoys science fiction! But I don't regret my years as a technical writer. I learned a lot, and met some terrific people. I just prefer writing fiction. How has your background as a technical writer affected your writing style and/or habits? There is something of a debate among technical writers that also write fiction. Some people believe that it helps them, thinking that any writing exercises the basic skills needed to write well. Others believe that technical writing is really a waste of time, and that it has no bearing on the ability to write good fiction. I remember an agent telling me that once, and I have the suspicion that most agents feel that way. Personally, I think the truth is somewhere in the middle. I know, for instance, that my years as a technical writer helped me with basic writing skills. You can't spend ten years writing without learning something, no matter what kind of writing you're doing. And really, the best way to get better at writing is simply to do it. If you want to write fiction, than of course that's where you should concentrate. But everything helps, I think. Especially when you're first starting out. As far as work habits, I think having been a technical writer has made me more disciplined. I've only been writing fiction full time for about a year now, so I'm still somewhat used to getting up in the morning and going to work. I don't have a problem starting my day, because I'm so accustom to it. I get up, take a shower, check my email, and then it's pretty much business as usual. And I'm really grateful for that, because the books I write are so long. If I wasn't disciplined, I'd never get them done! What kinds of writing courses did you take before you wrote the novel? How helpful were they? When I really got serious about writing a novel, I took some writing courses at a local college. These were the type of classes where the teacher gives you a different writing assignment every week, then you spend time at the next class reading what you wrote and critiquing each other's work. It was fun, mostly, and the teachers were great, but it's hard to say how helpful they were. As often happens in that kind of setting, the criticism you get is sort of softball criticism. Nobody wants to hurt anyone's feelings, so it's never very harsh, even when it needs to be. We had a lot of assignments where you had to describe something that happened to you in the past, some vivid memory that you want to put down on paper, and that kind of stuff is really subjective. It's hard to give an opinion about someone else's memories. A lot of people email me and ask how I got started writing, and if I think they should take writing classes. I always say yes. Education is never a waste of time, and the only way to get better at writing is to do it. If taking a class gets you started writing, than I support it entirely. And if you get the right teacher and the right mix of students, it can be a good experience. What was your inspiration for The Jackal of Nar? read plays a part somewhere in the story. When I started writing Jackal, I knew I wanted to tell a multi-layered story. I didn't want the plot to concentrate on just one character or on one theme. I knew I wanted to tell a war story, but I also wanted to create a unique world, and I wanted to fill it with diverse people, all of whom had their own sets of goals and problems. I needed a really big template to get all of that into one book, so I looked to books with big stories, like Shogun and Gone with the Wind, to see how those authors dealt with the problem. Of course, it isn't possible to get all of your ideas into one book, and that's why I'm happy to be writing a series. The themes that I wasn't able to delve into in Jackal will surely be used in future books. Still, if I had to pick one major influence for the book, I would have to say it's All Quiet on the Western Front, by Erich Remarque. I've told this story before, but I read that book just before I started writing Jackal, and something just clicked. I've never read a book that better describes the damage war can do to a person, and when I was done with it I knew where to start the story. I had my main character, Richius Vantran, and he was going to be young and caught in the middle of a war. Like Paul, the main character in All Quiet, Richius keeps day-dreaming about home. But he can't go home because he's stuck in a conflict that he didn't start. I admit that after the first few chapters, Jackal starts to look nothing at all like Remarque's book. But it's that kernel of an idea that got me going, that central theme that was the genesis of the story. And there's something else I'd like to say now that I have the opportunity. While it's fun for me to talk about influences, it's not really fair to compare The Jackal of Nar to a great work like All Quiet on the Western Front. When Remarque wrote his book he was trying to show the futility of war, and he did a remarkable job. I suppose in my small way I tried to do the same thing, but on a much smaller scale, and only in the context of an enjoyable and interesting story. I write to entertain. If my stories also make people think, then great. But I'm not trying to make any great statements. And really, everyone already knows that war is hell. They don't need me to tell them that. What led up to the publication of the book? Did you use an agent, or did you submit it directly to the publishers? Yes, I did use an agent, who shopped it around to publishers for me. This is another of those areas of endless debate, but I firmly believe a novel writer needs representation. Of course, getting an agent isn't so easy if you've never been published before, but it's worth the extra effort. A good agent who knows the genre can open doors for you that would never be opened otherwise. Even though there are publishers who still claim they read unagented manuscripts, there are fewer and fewer of them every year, and all of them are swamped with submissions. If you can get an agent that knows his/her way around, you've got a huge advantage. Interestingly, Bantam Spectra was my first choice of publishers, so you can imagine how pleased I was when they showed interest in the book. Anne Groell, my editor at Bantam, contacted my agent to say that she enjoyed the book very much, but that she didn't think it was ready for publication. Essentially, she rejected it. My agent called it a "soft rejection." But Anne also suggested some changes, and really took the time to be specific about what needed improvement. Not many editors are willing to do that. I took some time off from my job to make the changes, following her advice the best that I could, and then sent her back the revised manuscript. After a couple more months of waiting, she contacted my agent with an offer. I was thrilled. After that came two more rounds of changes, copy edits, and all the other stuff that goes into getting a book ready for publication. There are a lot of little thrills along the way, like when you first see the cover art or when you finally hold the finished product in your hand, a few weeks before it actually hits the shelves. What was the most challenging aspect of writing the story? Finding the time. I don't mean to sound flippant, but that truly was the toughest part. I was working full time while writing the book, and would do all of my writing at night when I came home from work. That went on for about two years, and it was really difficult. Fortunately I have a very supportive wife who took care of everything else while I worked on the book. Honestly, looking back I'm not sure how I was able to do it. I get a lot of email from aspiring writers, and one of the things they are most concerned about is time. It takes a real commitment to see a novel through to the end, and trying to juggle a full time job and home responsibilities makes it ever tougher. As for the actual writing of the story, the most challenging part was creating believable characters. I wanted to avoid the archetype of the strong hero and the evil villain. Jackal is definitely not a story about good versus evil. I tried to keep in mind that there are two sides to every conflict, and each side always believes that they're right. But usually the truth is somewhere in the middle. Richius, for instance, isn't the perfect soldier, and he makes a lot of mistakes through the course of the story. I think that's much more realistic than having a hero that always knows what to do and does it perfectly. Even the villains in the story aren't what they seem at first glance. I tried to give them motivations for the terrible things they do. I'm not excusing their actions, of course, but I did try to make them believable. The romance is an integral part of the story. Did you find it difficult to integrate the romantic elements into the story? Not really, because the romance was always meant to be a central story line. It's sort of a classic theme, really, having a man and a woman meet in a war zone, having them fall in love, then having them forced apart. For me, that part of the story really wrote itself. All I had to do was imagine how horrible it would be to lose someone I really loved. Thinking about that set the events in motion. Also, I think the romance sub-plot is the redemptive part of the story. There's that old cliche that "love conquers all," and in Jackal it really does. Maybe that's a bit naive, but after pages and pages of death and destruction, it's nice to know that two people who love each other can survive, and even thrive. The hero of the story is Richius Vantran, a complex man who faces some truly difficult decisions. How did you create Richius? To me, Richius represents the common man, the kind of person who always gets the worst duties in a war. I mean, just about all the soldiers in every war are regular men who don't want to be there. They do their duty because they know they have to, and because it's expected of them, but they would much rather be home living a normal life. Richius is just like that. Even though he's a prince, he's really an ordinary fellow. But he's caught up in extraordinary circumstances, and because of that things start getting out of his control. He's also sort of the story's straight-man. He's not as flashy or fascinating as some of the villains, but he's not meant to be. He's the character around which everyone and everything else revolves. And in a way, he's the most stable of all the characters. Despite all the things he goes through in the book, he's still relatively normal by the end. So far, I've gotten some interesting feedback from readers about the Richius character. Most people like him, but a few have been frustrated by him. They don't like some of the decisions he makes in the story. Whenever someone tells me that, I ask them to think about the character and the situations he finds himself in. His circumstances are really overwhelming, and I don't think most people would react any differently to such situations. Thankfully, most readers have had sympathy for the character. They realize that he's just a regular guy trapped in insane circumstances. Let's talk about Count Biagio -- he really is quite frightening! How did you go about creating him? Creating Biagio was a lot of fun. He became my favorite character, and as such plays a major role in the second book. "Besides learning how to write well and taking classes and all that other stuff, the most important thing is to keep at it. Write everyday if possible, and be disciplined. And if at all possible, hook up with another writer, someone who shares your passion for writing and your desire to get published. In this case, two heads really are better than one, and two people can learn how to write well faster than one person working alone." The most interesting thing about Biagio is that he was never intended to be a character. I write extensive outlines before I begin a writing, and nowhere in my outline for Jackal is the name Biagio mentioned. He just sort of sprang up out of my imagination, because as I was writing I realized I needed another character. I needed a liaison between Richius and the character of the Emperor, someone who Richius could talk to about Nar and learn from. And because the Emperor is so old and feeble, I needed a character who could challenge Richius on his own level, and who could travel. So I started thinking about henchmen for the Emperor, and I remembered how Adolph Hitler had all kinds of cruel and fanatical people around him, an inner circle of confidants that knew him well and who carried out his orders. That's how Biagio was born. He's the Emperor's spy-master, almost like a Himmler character. He is the head of a secret police force, and because he is so powerful everyone fears him. But even Biagio has his good side. He does some horrific things in the book, and he's certainly a villain, but he's also complicated, and even soft-hearted at times. Mostly this is seen in his love for the Emperor, who he adores like a father. He desperately wants the Emperor's approval, and is willing to do anything for it. I don't really know anybody like that, but I can imagine how a person like that might exist. Such devotion would probably make him or her very dangerous. What do you see as the main themes of this series? Well, there's the war theme, of course, and the romance, and those are probably the major themes of the book. But there are also a couple of others thrown in that I wanted to explore. One is the idea of beauty. I've always liked the story of Beauty and the Beast, and in Jackal there's a character named Tharn, who is a magical holy man. He's been horribly mutated by his use of magic, and I wanted to explore the idea that he's unlovable because he's so grotesque. That always strikes me as profoundly sad, because the fact is that looks are very important in our society. For Tharn, he has the respect and adoration of his people, but he doesn't have the love of the one woman he has always adored, Dyana. As Dyana gets to know Tharn through the course of the story, she learns to see past his ugliness, but she never really loves him. She respects and admires him, but her heart always belongs to Richius. And this is something that Tharn finds difficult to accept. He knows he's hideous, and having to live with his deformities shapes his personality. The other major theme of the book is about growing old. As people who have read the book already know, the leaders of Nar take drugs to keep themselves young. They're all terrified of getting older and dying. This is particularly true of the Emperor, a man who has lived for over a hundred years and will do absolutely anything to become immortal. Even Biagio fears old age, because he's very vain and his good looks are important to him. Like the Emperor, he is driven to stay young. For me, that's an interesting idea. Would I like to live forever? Or would I rather grow old gracefully and eventually die? I think all of us ask ourselves this question from time to time, and writing about Nar gave me a chance to examine it. I still don't have an answer, though. The city of Nar is an incredible creation: dark, industrial and quite overwhelming. How did you go about creating the city, and the rest of the world in which this series is set? World-building is always an important aspect of fantasy writing, and many authors take a long time in creating their worlds and bringing them to life. It's one of the most fun aspects of fantasy writing for me, because it gives me a chance to put together little bits of knowledge I have about many different cultures and history. That's pretty much how I created Nar City and the other settings--by fitting together various tidbits of information. To me, Nar City is like a cross between London and ancient Rome. It's a modern city, the center of the Empire and an incubator for technology. It's also the seat of imperial power, and I wanted it to have a fearsome quality. It's bigger than life and represents the repressiveness of the Naren system. Yet even though it's a frightening place, it's also kind of awe-inspiring. When Richius, the main character, travels to the city, he can't help being impressed by it, because he's from a little country of farms and ranches, and Nar City is the complete opposite of his homeland. He doesn't really spend a lot of time in the city, but he carries the memory of it with him throughout the book. The other major setting of the book is Lucel-Lor, a vast land inhabited by a race called the Triin. When I was creating Lucel-Lor, I wanted to give it an Asiatic flavor, as in feudal Japan. Lucel-Lor is made up of many different regions and climates, and each area is ruled by a different warlord. The Triin have been fighting amongst themselves for decades; it's almost a way of life for them. Their not war-like, precisely, just caught up in years of regional conflict. Lucel-Lor is very different from the Naren Empire. Unlike the Narens, who have one god, the Triin have many gods and diverse religious beliefs. They're also a simpler people, and much less concerned with materialism. Because they're so different, they're generally feared and misunderstood by the people of Nar. The ignorance that the cultures have for each other plays a major role in the story. Because Richius is a Naren, he's mistrusted by the Triin. And because the Narens know so little about Lucel-Lor, they think that the Triin have great secrets and magic. The Narens want to gain this knowledge, which sets off the major conflict in the story. Have you always been interested in military history? Pretty much so, yes. I think a lot of young boys are interested in the military, and then when they get a bit older it carries over into an interest for history. In many way, military history is history. Think about it--we often learn history in terms of wars and famous battles. When I took American history in High School, I remember jumping from war to war, starting with the Revolution and working up to Vietnam. I suppose it's because wars are watershed events in a nation's history. Every time there's a war, there is an aftermath. Sometimes countries are taken in completely opposite directions. That's probably the thing I find most fascinating about military history--how it shapes history in general. Then of course there's the "smaller" scale stuff that interests me, like famous commanders and strategy and so on. And also weaponry. Like many fantasy writers, I've always been fascinated by weaponry. One of the things that was most interesting for me about creating Nar was being able to invent new and unusual weaponry for them to employ. Some of the things that have been created in this century have been truly ghastly, and I wanted to reflect that in the story. Nar has oil fuel, for instance, which they use in a weapon they've designed that's very much like a flamethrower. They also use a type of poison gas, reminiscent of World War I. They have war labs whose sole purpose is to create new weapons, which they use against people that defy them, like the Triin. Really, I don't think that's so different from what many countries have done this century. When reading a military epic, it is tempting to read behind the lines, and infer the author's views on current events. What personal views of yours do you feel are reflected in the book (about politics, war, love or just views on life in general)? You're right-It's easy to read into things, especially when an author is creating a new world. Whenever I read a science fiction or fantasy novel, I always ask myself those questions. Does the author actually believe that a militaristic empire could keep the peace? Is he saying that homogenous cultures are better than pluralistic ones? The questions can go on endlessly, and I admit that Jackal leaves a lot of room for speculation. I don't mind that, and I don't mind people asking me my views, but I really don't have any hard answers. For me, it's all about the exploration of ideas, but I never come to any real conclusions. Like the reader, I'm just speculating about things. And they're always things that interest me, like politics, war, etc. It doesn't look like I've answered your question, I know. But really, I don't think I'm telling any profound truths in the book. It's really just a story, and though I'm sure it's colored somewhat by my perceptions of things, it's just meant to entertain. Let's talk about the female lead in the book, Dyana. What was your inspiration for Dyana? The character of Dyana came out of my need for a strong female love interest. She's the woman Richius meets and falls in love with during the war. For Richius, Dyana represents the only decent thing to come out of his whole experience in Lucel-Lor. Because of that, he sort of idolizes her. Of course, Dyana isn't perfect at all, but Richius doesn't see her imperfections. To him she is just a beautiful girl in the middle of a terrible, ugly war zone. Dyana was probably the hardest character for me to create. Even though there are long stretches of the story where she doesn't appear, she's sort of the engine of the plot. Now, I know there are male writers who have no trouble writing about female characters, but I'm not one of them. It's hard for me to get into their heads, and perhaps that's why most of the characters in the book are men. When I first submitted the book to Bantam, Dyana wasn't really a character that could stand on her own; she was just Richius' idealized view of womanhood. Anne Groell, my editor, made some suggestions on how I could improve her and turn her into something more than a young man's fantasy. She wanted Dyana to be more feisty, more independent. At first it was difficult for me to make the changes, because I didn't want Dyana to interfere with Richius' characterization. But after reworking her character, I saw that Anne had been right. It really improved her, and made her much stronger. Because Dyana grew so much in the story, she plays a major role in the next book. Can you give us a sneak preview into the next novel in the series? The second book is called The Grand Design, and takes place about a year after the close of Jackal. As I mentioned, Count Biagio and Dyana both play major roles in the story, and actually the Richius character is down-played a bit. It's much more of an ensemble story, with lots of different characters and not one major character that steals the story from the others. Because of the various viewpoints and sub-plots, it was more difficult to write in some ways than Jackal, but also more rewarding. It's also a bit less heavy on the military stuff, and more reliant on intrigue. There are still battles and military strategy, but this time Biagio the spy-master takes center stage, and his character puts a major spin on the story. Readers of the second book will also get their first look at Liss, the island nation that is mentioned in the first book but never seen. The Lissens are a race of sea-goers who have been at war with Nar for a decade, but who have never been conquered. They're a valiant race, but because they've been under assault for so long they're also rather vengeful. They play a significant part in the story, and contribute to its theme of vengeance. Writing The Grand Design was great fun, and I'm really looking forward to its release. I hope people enjoy reading it as much as I enjoyed writing it. So many writers with unpublished manuscripts despair of ever getting that first book sale. What's your advice to aspiring authors? "As for the actual writing of the story, the most challenging part was creating believable characters. I wanted to avoid the archetype of the strong hero and the evil villain. Jackal is definitely not a story about good versus evil. I tried to keep in mind that there are two sides to every conflict, and each side always believes that they're right. But usually the truth is somewhere in the middle." in handling me, and even more fortunate to find an editor willing to take a chance on an unpublished author. That's not to say I didn't work hard, because I did, but hard work will only take you so far. Eventually, you're going to need that elusive bit of luck to get you in the door. So for all those aspiring writers out there, just be sure this is what you want to pursue, because it's going to take a long time and there aren't any guarantees. Of course, most writers, published or otherwise, have a calling to write, a genuine need to tell stories and put words down on paper. So for them I will echo the advice of countless writers before me--stick to it. Besides learning how to write well and taking classes and all that other stuff, the most important thing is to keep at it. Write everyday if possible, and be disciplined. And if at all possible, hook up with another writer, someone who shares your passion for writing and your desire to get published. In this case, two heads really are better than one, and two people can learn how to write well faster than one person working alone. For me, working with my friend Ted was crucial. He gave me excellent feedback and was always honest with me, and I know that Jackal is a much better book because of his involvement. Another thing that was really helpful to me was audio books. Reading is always great, of course, but audio books were key to helping me understand the rhythm of writing. When something is well written, it has a distinct cadence, and I never realized that until I began listening to books on tape. It was really eye-opening, and helped me immensely. I still try to capture that musicality every time I write. Also, aspiring writers are often told to read a lot. I agree with that completely, but I would also add that they should read widely. Even though I set out to write a fantasy, I didn't just read fantasy novels exclusively, and I still don't. The best way to get a handle on writing is to read a variety of genres and styles. How much do you use the Internet ? I love the Internet. Nowadays, when I need to know something the first place I look is the Web. Doing research on the Internet takes a little getting used to, but what's you learn the ropes it's terrific. I even shop on-line now, and when my local bookstore doesn't have a title I'm looking for, the online stores always get it for me. I don't know how important the Internet will become in the future, but right now I think it's great. The Internet has also allowed me to get in touch with my readers. I have a Website for the series, and I get a steady flow of visitors every month. They tell me what they think of the book, ask me questions about future titles and about writing, and just keep me in touch overall. So far the Web has been a great medium for me to advertise my work, and I'm very grateful for it. It's really tough for a new author to get any attention, but the Web has helped to even the playing field a bit. Who are some of your favorite authors? What are you reading right now? There are many authors whose work I enjoy, both in and out of the fantasy genre. Some of my favorites are Clive Barker, Thomas Harris, Peter Benchley, Anne Rice, and Tad Williams. Right now I'm reading the latest novel from one of my favorite fantasy authors, J.V. Jones. I have also been enjoying a series titled His Dark Materials by Phillip Pullman. There are two books in the series so far, with a third one promised. The first two books were really spectacular, and garnered a lot of well-deserved attention. I don't know how other writers feel about this, but it's often difficult for me to read the work of authors I admire. Despite the fact that I'm enjoying their work, I can't help but make comparisons to my own stories and style. Very often I find myself wishing I had done something as good, and resolving to work harder next time. I suppose the key is to keep trying, and to remember that it's a growth process. And perhaps we never really reach the place we want to be. Perhaps it's all just a journey. When you're not writing, what do you like to do to relax? Pretty much the same type of things that most people enjoy--reading, going to the park, cooking, taking long drives, etc. I don't go in for anything adventurous, and pretty much the only sport I enjoy participating in is fishing. I really have a simple life, and now that I'm writing full time, I'm very happy.